By filling the provided survey you will be rewarded for your honesty and the time that you will take out for responding. IndiaSpeaks is an online survey panel where consumers join hands to shape and develop products and services by voicing their opinions through surveys launched by brand-owners. Your opinion matters. And now we give you an opportunity to benefit from your opinion every time you express it. After completing the survey successfully, the survey taker will be rewarded by Rs 50 Paytm cashback. 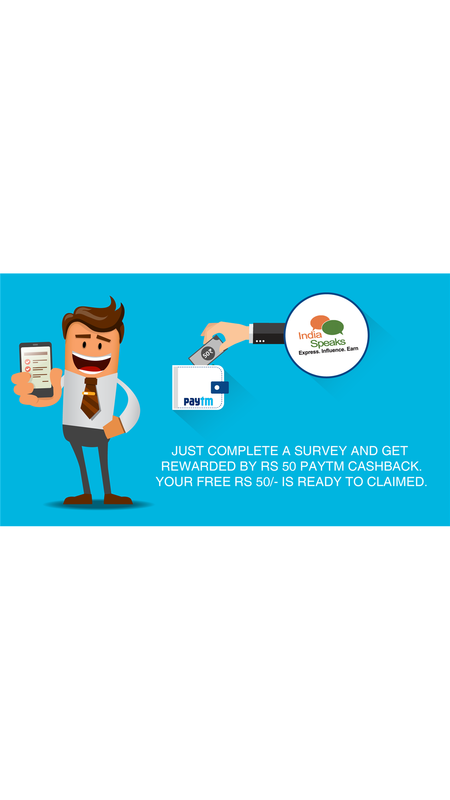 Paytm cashback will be rewarded only to those who have completed the survey. The cashback will be added after the validation process which might can take 7-10 working days. Participation in the Campaign open only for three days (Start date: 20th Feb 2017 to 24th Feb 2017). Offer is valid for all user. Applicable only one time per user during the offer period. Mobile number needs to be verified to be eligible for cash back. The survey is required to be filled form your mobile device only. Submission of survey from desktop will not be entertained. Valid from 20th February till 24th February.